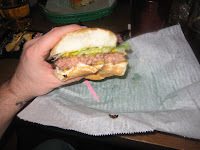 Located in downtown East Lansing, the home of Michigan State University, Crunchy’s proudly holds the title of “Best Burger in Town.” In the 5 years I attended school there, I can honestly say that I was never served a better burger than the 1/2 pound crunchy burger. 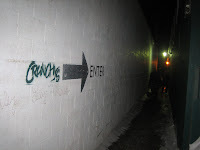 In fact, I even had a meal plan at Crunchy’s. 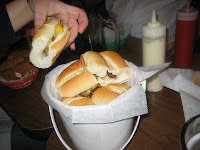 With great burgers, pizza and other bar related food items and beer available by giant mug or by bucket, it made for the perfect college dining experience. 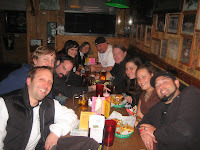 Since the place was opened by original owner, Paul “Crunchy” Gratarolla in 1982, Crunchy’s gone through several changes. New ownership, a patio, weekly karaoke and a beer menu beyond light and dark Stroh’s but it has kept one thing — the moniker “Best Burger in Town.” Leave it to Burger Conquest to put it to the test. 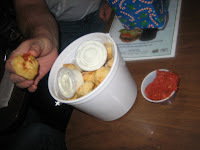 We started with a “Bucket O’Pizza Nugs” – deep fried pepperoni and cheese in dough, covered with Parmesan and served with dipping sauces. They were very tasty shoe horn into a heart attack. As always, I went cheese burger served medium rare. They over cooked Cara’s and Molly’s burgers as well as my own and undercooked Lynette’s bucket of “Lion Stout Buddys,” Crunchy’s take on a sliders that have been marinated in their exclusive Lion Stout beer, which is never a good start. But once they righted the wrong, the feasting began. 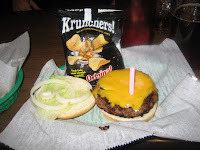 The burger choices are plentiful at Crunchy’s but for me it could only be one, the Famous Crunchy Burger. 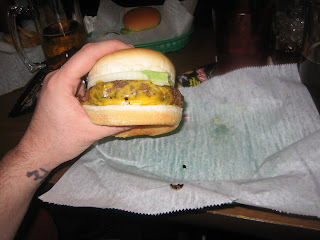 A simple white bun, wrapped around a delicious and juicy 1/2 ounce piece of hamburger and cheese entered my mouth. It was just as I remembered, tasty, delicious and wonderful. The burger was bigger than the bun but just right. Oh man, if I only lived closer! The Famous Crunchy burger proved it’s the Best in town. 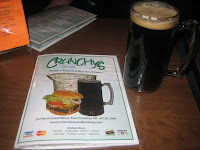 This entry was posted in Bar, Beer, Burgers, Hamburgers, Michigan and tagged best burger, buckets, burger conquest, cheese, ciancio, crunchys, french fries, hamburger, lansing, michigan, nyc, rev, review, the great burger conquest crunchys east lansing michigan cheese, the rev meter for social community. Bookmark the permalink.